It has been more than a year since the White House announced that it would “soon” be releasing the results of a U.S. Landmine Policy review that was launched early in President Obama’s first term in office. In November 2013, the USCBL members sent a letter to the White House, requesting that the United States go public with its position before the Mine Ban Treaty’s annual meeting in December. It didn’t happen. The signers include leaders from Amnesty International, Handicap International, Human Rights Watch, the Friends Committee on National Legislation, and the Arms Control Association, among others. The USCBL letter argues that it is vital for the United States to take a strong stand against landmines. To date, the United States is one of only 36 countries–including North Korea and Iran–that have not joined the Mine Ban Treaty. The United States is the only member of NATO and the only country in the Western Hemisphere (besides Cuba) that has not joined. According to the USCBL, more than 16,000 people have been killed or injured by a landmine since the beginning of the U.S. policy review process in 2009. 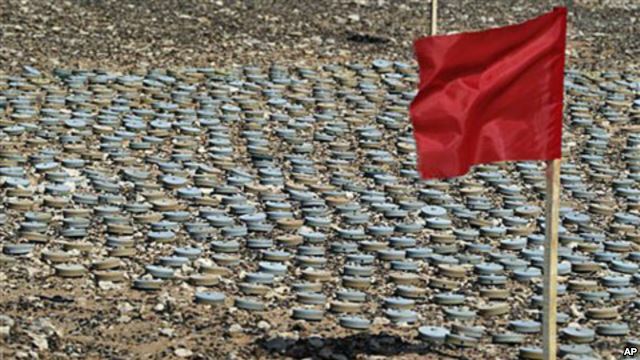 While the United States has not used antipersonnel mines since the First Gulf War in 1991, it still maintains a stockpile of more than 10 million antipersonnel mines for future use and the thousands of unexploded landmines worldwide still represent a serious threat to noncombatants. Resistance to joining the Mine Ban Treaty comes from some in the United States who want to retain the option to use so-called “smart” landmines – those that are equipped with a self-destruct and/or self-neutralizing feature – as a defensive mechanism to protect U.S. troops. The USCBL argues that these concerns can be addressed through alternative military measures, and that the humanitarian value of phasing out mine use globally far outweighs any perceived military value to the United States. Now is the time, they argue, for President Obama to provide stronger leadership, to reinforce the norm against using landmines, and to push remaining Mine Ban Treaty hold-out states to reconsider their position. This entry was posted in Conventional Weapons and tagged landmines, Mine Ban Treaty, Ottawa Convention, U.S. Campaign to Ban Landmines, U.S. Landmine Policy, USCBL. Bookmark the permalink. There is no “Mine Ban Treaty.” The Ottawa convention does nothing whatever to prohibit or restrict production, use, or export of landmines that are long-duration and/or non-detectable so long as they are labeled “anti-vehicle mines,” These infernal devices can and to destroy buses, tractors, and automobiles and the people in them for decades after the conflict has passed. The Clinton-Bush landmine policy is is far more effective in that it prohibits us of all persistent landmines and can’t be circumvented by relabeling.